Chronicles of building the more beautiful world our hearts know is possible. “Poverty” is not a word I would ever use to describe my soul... my art, my laughter, my love and my visions… though on paper, it is certainly a word used to describe my income. I could begin by launching into explanation of my circumstances, mentioning an abusive past, an unexpected pregnancy, and a long journey of mental health challenges… but I’d really rather not categorize myself that way. The truth is, I prefer to live simply in my commitments and keep plenty of space in my life for creativity, rest, communion in nature, and supporting those that I love. Time and time again, I have proven to myself that filling my schedule with too many unfulfilling obligations renders me mentally and physically sick. Perhaps I am “too sensitive,” but I prefer it that way. I would rather be poor and happy than well-off and stressed. All summer, I’ve been satisfied with working just enough to cover my modest expenses with a bit of wiggle room. I hit the lottery of “affordable rent” in Berkshire county, lived closely to my daughter’s father who graciously enabled me to work and have a little time for myself, and I enjoyed finally settling in to a home rather than squatting in camper trailers, tents, and friends’ houses like I have been for three years prior. All was well enough on paper, yet I was still managing a restlessness in me that just would not go away. Sure, I was scraping by, but what would happen if my ability to generate income suddenly went away? What solution could I offer for the countless creatively gifted and intelligent people I know that suppress their true nature just to struggle to house themselves and their families? Home is what we are all pining for… and somewhere deep down we have this sense that we maybe had it before, but not here on Earth. My ground started crumbling beneath me in June when I spontaneously developed an asthmatic reaction to my environment that left me fearing for my life every day. The panic and confusion due to never having dealt with this before and several trips to the ER led me to writing my will this summer. I had a lot to learn and a lot of wounds to heal. At around the same time, a string of synchronicity led me to meet my life partner. The following months consisted of intense transformation in myself and with my partner involving a necessary letting go of habits and commitments that do not serve holistic wellness and a harsh reminder that our bodies and our passions need to be nurtured right now. Not later. Marco and I, my partner along the journey of building home and community. Life with asthma was now incongruent with life smoking cannabis every day. And what do you do when you’re swimming in anxious thoughts without your typical coping mechanism available? Dive even deeper into creating your music and art every day, of course! Oh, and embody this radical concept of responding to anxious situations with active solutions and honest communication. Though my newly damaged lungs posed a giant challenge in my life, ultimately amazing new clarity and many healthy habits developed because of it. Rolling the ball of creativity by consistently producing music and art felt so rich and reminded me that these are my true gifts... these are the platforms in which I can express my real voice. It sunk in that I am doing myself and humanity a disservice by refraining from sharing these parts of myself far and wide. As the summer went on, it soon became clear that life with asthma and life making a living by cleaning was also becoming incongruent. I had a bit of savings and a very loose plan of how to continue making money using my creativity, so I found confidence in refusing to clean for money anymore while irritating my lungs with dust and mold. I quit one of my jobs and voluntarily gave up half of my income. Then, almost immediately after, I crashed my car, incurring repair costs greater than what was in my bank account. Times like these remind us how much of our validity as human beings in civilization relies on our ability to travel and consume. Though we all know this deep down, it can take personal experiences like these to remind us how heavily we collectively rely on fossil fuels and money to survive on this planet. This is the dark truth of which our capitalistic world is founded upon. The rate at which we consume and extract fossil fuels and the non-negotiable value we place on monetary gain is without a doubt destroying the natural harmony of life on Earth. The evidence is clear when entire cities lose these resources suddenly, and havoc and disaster ensues. Without a car, without money… it can feel like a crippling obstacle to fully participate in the modern world. It can feel extremely isolating, invalidating and even dangerous. Yet, so many people in the world don’t have easy access to these resources. Besides that, I can’t help but feel like relying on these resources almost solely for survival is more of an embarrassment than an accomplishment. In my opinion, it should not be the norm. However, I still utilize them everyday because I haven’t yet fully integrated all the alternatives in my life. I am very lucky and acknowledge my privilege here. The loving connections I’ve cultivated around me and my deeply spiritual view of life has led me to feel an unwavering trust in myself and support from the universe. Through all of the anger, resentment, powerlessness and hopelessness that arises in me when facing the realities of the economic system in the world we live in today, I am only pushed toward finding deeper gratitude. I remember the sacredness and fragility of life. I remember the absolute honor it is to be given the position to be in care of a beautiful child. I acknowledge that I desperately need human connection and support in my endeavor to generate financial capital sustainably for myself and my daughter as soon as possible. I now find myself in a mad balancing act: creating a strategic plan for financial self-sufficiency, while working with my current budget and reducing living expenses. I am embarking on this journey with the intention of preserving the integrity of my truth. I am unwilling to compromise my heart’s core values. I declare to use my soul’s true gifts to create financial abundance for myself and others. I am here to serve my greater purpose. I intend to deliberately create a compassionate world with my contributions. I have been exposed to so many people that embody alternative ways of sustaining themselves while simultaneously upholding their values. 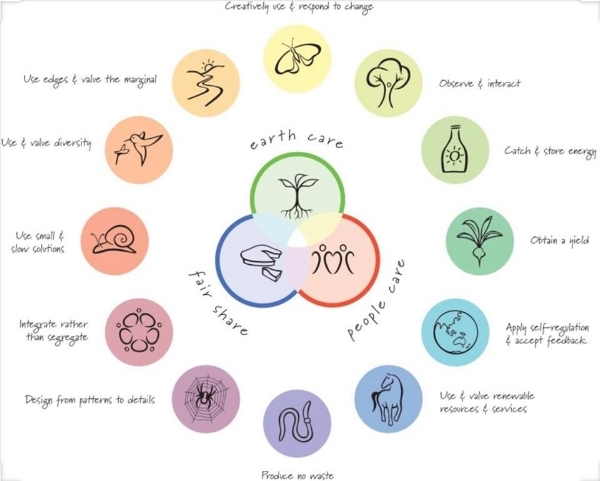 I believe the answer lies in applying the principles of permaculture to all parts of our own life and our social world. Some discover these ways of life through necessity, others in the journey of working towards creating a better world for everyone, and others through a natural passing down of ways through generations. I remind myself that it is instinctual and ancient to be closely in tune with nature and rely on natural resources and rhythms for survival. The truth is we still rely on the Earth for all of our resources, but in a much more indirect, processed and isolated way. The system that perpetuates the view that money and fossil fuels are the most important needs for survival requires a complete overhaul… but first, it starts with me. It’s always funny to me how my unwavering trust in the universe (regardless of how I perceive circumstances as being positive or negative) ultimately comes to serve my intention to fulfill my greater purpose. At the same time that I ran out of money, I ran into a beautiful work trade living opportunity in the Hudson Valley. 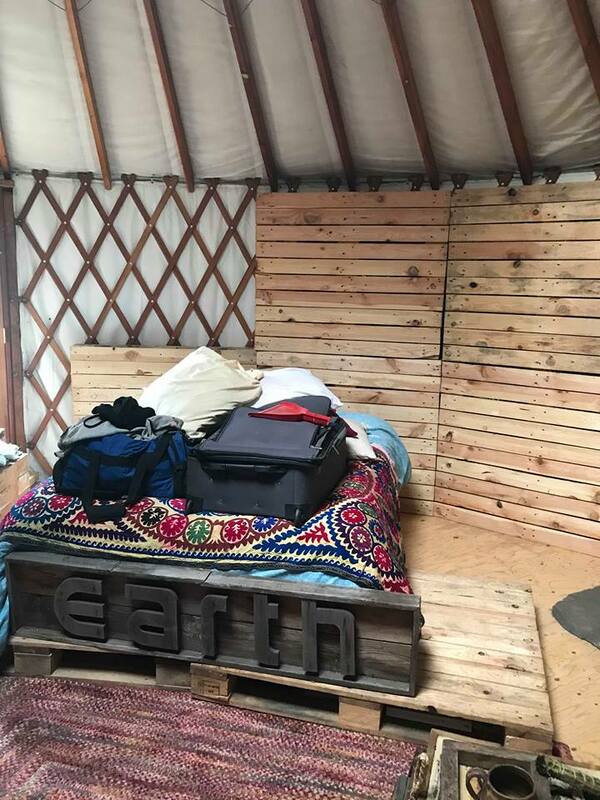 By living in a yurt with my partner, I am able to uphold many of my values and rely directly on nature and my own intentional labor to provide heat and shelter. By working in tandem with the landowners and their children, I rely on trust, clear communication and mutual respect in relationship to secure my housing rather than simply giving my time away for money to pay for housing. I have been slowly unwinding my beliefs that I am doomed without modern structures and ways of life. I am slowly relearning the ways of our ancestors to survive in harmony with nature, with a modern twist. I am claiming the power I possess to enhance my life by putting energy into my passions, trusting that it will return to me as income soon, and reducing my expenses wherever possible. In our yurt, we use all recycled pallet wood and salvaged scraps to build our insulation, our furniture, our kitchen, our outhouse, compost system, and plenty of creative play space for the children. We use the “waste” of the modern world as the foundation for what we can build down to the smallest details. Surprisingly, or maybe not surprisingly at all, we are swimming in useful waste. While one half of the population goes without access to resources, the other half is drowning in too many. There is an astounding abundance of free resources and natural materials all around us waiting for us to ask for them and to use our power to utilize them. I am learning that resourcefulness, unconditional community support and building skills are immeasurably valuable. I consider them top priority to put my time and energy into cultivating. The first dresser I built on my own… a coming in to my own power! The first time my daughter saw the play space we built for her. More and more often lately, I find myself asking the questions: What can I grow? What can I make? What can I borrow? What can I trade? What can I directly exchange my labor for? No matter what circumstances we find ourselves in, I find that the primary question we need to ask ourselves is: What can I give? It is in giving ourselves, our time, our energy, our gifts, our passions, and our words where our security truly lies. The foundation of human life is built with generosity and cooperation. We rely on each other all the time to perpetuate and create the systems of survival we depend on even if there is no soul involved. Life can be joyful and fulfilling when we put our whole true selves back into our interactions with each other and the Earth and acknowledge our interdependence. This is our journey of Soul Thriving… and this is what I intend to keep writing about and sharing with you on this blog as we begin to literally and metaphorically build our lives in alignment with these values. So, now with a bit of bought time and space to sit back at the drawing board, I return with new determination to stay true to myself. The truth steadily remains while I teeter between fear and guilt, gratitude for having everything I need right now, and pride in myself for even acknowledging where I am. I may have never come to these realizations if I started off my adulthood in a comfortable financial place… and so I am incredibly grateful for my poverty for bringing me to a place of truth and tangible desire to live a life in accordance with that truth. I feel so blessed. Thank you to all the angels that have shown up for me on this journey. It inspires me to be the angel for someone else. I do need money, but more importantly, I need humans that want to connect with what I have to offer. We are the ones who create and name the abundance that we share. We are all in need here, and we are all dealing with our own special circumstances. We need to realize how many of us in our immediate community are truly suffering. It is within our power here to make a difference. How many of us go cold, hungry, scared, unheard, unloved, unsatisfied? We are all affected by the forceful separation of humanity from each other and from the Earth. It no longer make sense for us all to be working so hard to support a single family household as if we are all left to fend for ourselves. What if we eased up on the rigidity of our definition of what’s yours and mine? What if we were given the tools of communication and accountability to learn to successfully support one another and share our resources? What if we decided that there is more than enough resources for us all to live peacefully and embraced a life beyond surviving? What if we agreed to uphold our truest values collectively? What if we valued all life? I think we would all find that we could be both well-off and happy.